Honolulu Museum of Art » Mr. SOUL! Home / Events / Doris Duke Theatre / Films / Mr. SOUL! Right on the heels of the Civil Rights Movement, one fearless black pioneer re-conceived a Harlem Renaissance for a new era, ushering giants and rising stars of black American culture onto the national television stage. He was hip, smart, innovative, political and gay. In his personal fight for social equality, this man ensured the Revolution would be televised. The man was Ellis Haizlip. Haizlip was the host and executive producer of SOUL!, the first “black Tonight Show.” In 1968, SOUL! was launched as a local, New York broadcast. In 1969, the series rolled out nationwide on PBS and on WNET Channel 13. By 1973, Haizlip had produced over 130 hour-long shows featuring a dazzling array of A-list guests: Sidney Poitier, Harry Belafonte, James Baldwin, Stevie Wonder, Maya Angelou, Ashford and Simpson, Nikki Giovanni, Al Green and Muhammad Ali—even a 16-year-old Arsenio Hall doing magic tricks. Mr. SOUL! invites us behind-the-scenes of this groundbreaking phenomenon, from its initial conception to its final broadcast, including the very public battle to keep it on the air despite a shifting political landscape. Who was this innovator, determined to fight for liberation and acceptance through cultural expression? Why did this Emmy Award-winning show lose funding at the height of the Black Arts Movement? How is SOUL! relevant today, when diversity in media remains a paramount issue? Mr. SOUL! 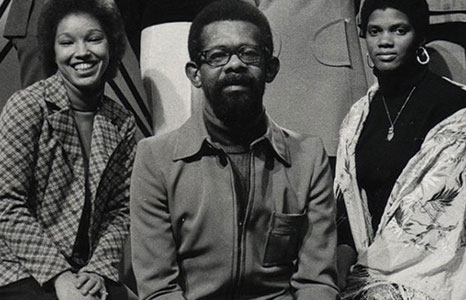 starts a new dialogue about this critical moment in American broadcast history while offering a nuanced and fascinating portrait of the soul behind SOUL!, Ellis Haizlip. Read the Women in Revolt interview with filmmaker Melissa Haizlip here.